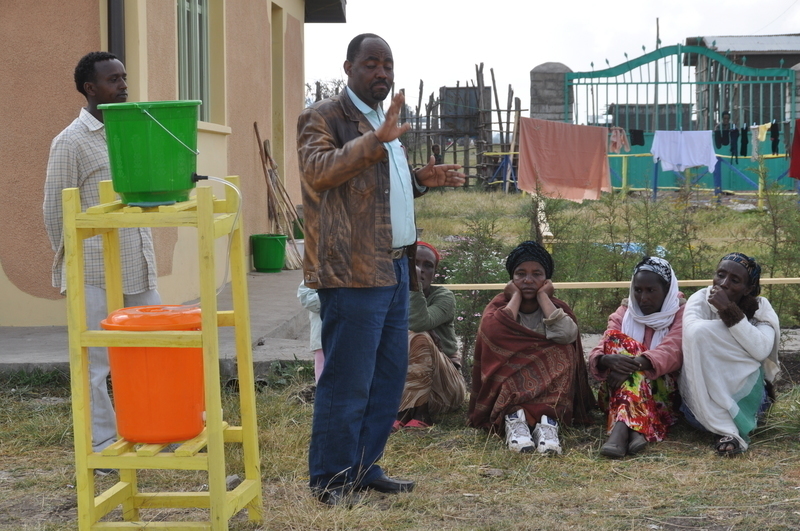 Families living in the destitute town of Bekoiji in Ethiopia now have a greater chance of good health thanks to a team of volunteers from the UK who built and presented water filters to the local residents. Children from many of these families attend the Stand by Me Bethany School where they receive a quality education, regular food and medical care. Until now, these children have returned to their homes where they do not have safe drinking water, the government have not yet installed water pipes in the local town. The team built 20 wooden frames to hold the water filters, which are connected to plastic buckets, and handed them out to families in the community, alongside teaching on how the system works. These families will now be protected from water-borne diseases such as dysentery and diarrhoea and can remain hydrated and healthy, thanks to our team of volunteers. During their two week stay in Bekoiji, the team also carried out extensive refurbishment and renovations to our two children’s homes and school. Four of the school classrooms have now been painted and decorated, as has the dining hall, and fencing has been erected around much of the site. With the help of our visiting teams and by offering employment to local workmen, the Stand by Me site is steadily growing. It now encompasses eight classrooms, a dining hall, two children’s homes and a guest house and a further children’s home, a cook house, a guard house and a school storeroom are all underway.